Our children learn how to sue specific hardware and software in their Computing lessons. They also use technology throughout the curriculum an the children have been using an APP called Book Creator to capture their writing. 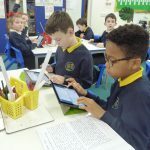 This engages the children in that they are writing for a purpose – to create a book for younger children to read and enjoy – as well as develops their computing skills which they will use in whatever career they choose in the 21st Century.